There can be little doubt that aggressively dominant male chimpanzees, and such “alpha males” in other mammal species, tend to monopolise reproduction and therefore pass on genes that help elevate their descendants to that position. Genes carried by less-endowed males have a diminished chance of being passed to later generations. In the case of chimpanzees, there is another factor: some groups occasionally hunt other species, or members of other chimp groups, and thus add meat to their diet. This is a trait that they share only with humans among the other great apes. Whether they are skilled hunters or not, alpha-male chimps expropriate a far greater share of such kills for themselves because of their aggressive dominance. So their diet includes more protein than that of other group members, reinforcing their strength. While hunting among chimps involves considerable cooperation, a successful outcome results in a free-for-all among members of the hunting group. Nor is there any meat-sharing with females, who seem not to engage in hunting. Hunting by males lies at the centre of Boehm’s argument, with little mention of the foraging for other foodstuffs conducted by all group members, but especially by women and children. That is odd, considering that numerous studies of subsistence by surviving hunter-gatherer groups highlight the dominance in their diet of plant foods and small-animal protein (from grubs, rodents etc), produced by continual foraging. Hunting is spasmodic and frequently unsuccessful. The only hunter-gatherers groups that are heavily or even completely reliant on successful hunting of large prey are those of the Arctic, who are only able to forage for meagre plant items in short summers. Four out of the ten sources of Boehm’s data on hunter-gatherers are North American and Greenland Innuit, who – unlike African groups such as the San and Hadza,[i] and the original inhabitants of Australia – developed their unique dependence on hunting large marine mammals only in about the last five or six thousand years following the retreat of vast polar ice caps of the last ice age. Male hunters among surviving hunter-gatherer groups share meat with all members of their group, and – apart from some organs, such as the liver, traditionally reserved in some groups for the hunters themselves – generally this sharing is equitable. If there was a “Big Man” analogous to the chimpanzee alpha male, that would not be possible. Boehm proposes that some time in the millions of years since hominins diverged from the last common ancestor with chimpanzees, social controls (as discussed in the previous section) emerged, to ensure equitable sharing and the cooperation needed in regularly successful hunting. Such measures in turn encouraged increasingly conscious self-suppression of the traits associated with alpha-male dominance, eventually to produce those positive aspects of human morality so well displayed by surviving hunter-gatherers. Most important to self-suppression would have been the emergence of conscience and of feelings of shame and embarrassment. Boehm attributes these changes in behaviour and psychology to natural selection, and to the “hard-wiring” of changes in unspecified genes, through a variant of Darwin’s theory of natural selection. That is, the changed genetics had to have selected for morals and self-suppression, and against all the traits bound up in alpha-male behaviour. In order for such positive aspects somehow to enter the “programming” in DNA, they must have conferred a greater ability to reproduce successfully. Boehm does not go into details. But natural selection of a change to the “status quo” first requires a mutation in an existing gene or group of interacting genes, that might, with a host of other links, code for the evolutionary outcome. An example would be a change in the brain’s conscious processing through a neural network between whatever linkages control empathy, recognise a moral violation or move people to shame or embarrassment. successful in attracting female attention and thereby successfully reproducing and passing on the gene(s) involved. Boehm once more remains quiet on the female counterpart. His other proposed form of “social selection” is via group punishment of bullies, freeloaders and other deviants from the social good. Deterrent actions, from “naming and shaming” through shunning and expulsion to execution, work in the opposite Darwinian direction, decreasing the likelihood of offenders passing on their genes to succeeding generations. From the standpoint of sociobiology, Boehm’s model might seem plausible. It probably would, too, to most people whose understanding of genetics and natural selection comes from reading Richard Dawkins and other popularising sociobiologists and “ultra Darwinists”. But we can question the arguments, the limited data on which they are based, and thus the conclusions, on the basis of factors that Boehm omits. The only tangible evidence cited by Boehm to support a genetic origin for morals is blushing, which he claims is an innate physiological response to a sense of shame that is uniquely human and evolved at the same time as conscience – a “dead giveaway” for those who have done shameful things, one might think, and likely to have been suppressed by the Darwinian processes on which Boehm sets such great store. Yet blushing is widely regarded by psychologists as being closely related to physiological processes triggered by severe stress or perceived physical threat common to most mammals. The reaction presents the conflicting behavioural alternatives of “fight or flight”. A preparation for either involves a rise in breathing and heart rates, and alternation between blood movement from the body core to muscles, and its withdrawal, that results in flushing and pallor, as well as a host of other bodily changes. Consciousness of having done something that may carry punishment, deep embarrassment for a social gaffe, fear of being unprotected, as in nakedness, co-opts aspects of the unconscious “fight or flight” response – most noticeably, dilation of capillaries in the face and neck, and reddening as they are filled with core blood. Boehm considers that his proposed gene-centred trend towards morals began once Homo sapiens began to hunt large prey animals after 250 ka ago, culminating when they encountered harsh environments in Europe about 45 ka ago. He claims that “big-game” hunting by males added substantially to the human diet and became an essential survival strategy. It centred on meat-sharing among the whole group. He claims that earlier hominins did not practise such sharing, and that it had to evolve, once the opportunity arose, from the alpha-male-dominated behaviour inherited from “Ancestral Pan”. Just how shaky the assumption of a common ancestor with chimpanzees is has been mentioned earlier, but there is a more substantial problem for Boehm’s proposal: chronologically, it does not fit with the fossil record. Human physiology enables us to run for hours, if we have to. Through our lack of bodily hair, and because of the cooling effect of sweating, such endurance running is possible during the hottest part of the day even in the tropics. Herbivores such as antelope can run faster than humans, but very quickly succumb to heat exhaustion and so become easy prey. Hunting such “big game” by simply chasing them to death does not require sophisticated weapons, contrary to Boehm’s notions: it seems that the human frame, which emerged at least 2 million years ago, evolved a natural ability for such predation. Just how necessary for a high-protein diet is big-game hunting anyhow? Much the same dietary advantages exist on the sea shore and by large lakes; indeed there is as much evidence of early humans subsisting on marine resources as there is of their eating large mammals on the plains of Africa. The earliest signs of artistic culture and major advances in the processing of rock to tools around 100 ka appear in caves close to where the Klasies River meets the Indian Ocean in Eastern Cape, South Africa. Beachcombing as a subsistence strategy has been around since at least 1 Ma, as shown by evidence in uplifted reefs on the Red Sea coast of Eritrea. And, of course, it is as easily done by females and children as it is by males. A major change took place in hominin physiology once early members of the genus Homo emerged. Like other great apes, australopithecines had large bellies to accommodate the extended gut needed to digesting a diet dominated by vegetable matter. That disappeared abruptly with the emergence of the earliest humans, to be replaced with our characteristic waist and barrel chest. Many physical anthropologists link this profound change with the emergence of a diet dominated by meat (see Part 1, note 9). This would have been possible only after the invention of stone tools – no hominin has ever had teeth capable of biting through the thick skin of large prey or tearing flesh. Meat is not only a concentrated source of protein and fats but is more easily digested than plant matter, hence the decreased gut size. Modern physical anthropology also considers a meat-rich diet essential for the evolution of increasingly large human brains, triggered by the leap in consciousness that foresaw sharp tools in lumps of hard rock that fed back to enhance consciousness, which in turn enabled the cooperative planning and strategy demanded in order to acquire more meat and other previously less accessible food items. Together with the total lack of any fossil evidence for chimp-like male competition among all species of Homo – indeed in all hominin fossils back as far as 6 Ma – and the similarity between male and female stature and brain size in successive human species (see Human ancestors: the hominin record in Part 1) – actual evidence of cooperative behaviour shows that meat sharing has probably been a human habit since their appearance 2 Ma ago. 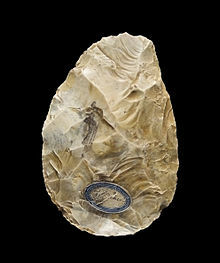 It preceded increasing consciousness as charted by increasing sophistication of stone tool manufacture: the famous bi-face stone “axe” developed by H. ergaster entered the record some 1.6 Ma years ago. It also preceded, and was arguably essential for, numerous migrations out of Africa, the first known being at around 1.8 Ma. Throughout Moral Origins Boehm repeatedly insists, with not a shred of evidence, that gene-based evolution of morals was honed to completeness 45 ka ago. He occasionally extends that to 250 ka, but this seems to me like a cautious afterthought. After all, the 45 ka date for a “human revolution” has some unacceptable connotations, being associated with the Eurocentric view that something special was achieved by the first anatomically modern Europeans – the cave paintings, novel stone tool kits, ritual, music and more besides – something else on which Boehm is reticent. To an Australian or Papuan aboriginal half a world away, whose ancestors left Africa around 100 ka ago, migrated across Eurasia, then navigated from Timor across open ocean to unseen lands to develop rich cultures, that might seem as offensive as it would to any surviving African hunter gatherer “left behind” 100 ka ago. It has recently been shown that the Khoisan people of southern Africa – who provided some of the evidence on which Boehm’s thesis hangs – became genetically separated from the rest of us at least 100 ka ago (see note 1 below). Of course, a more charitable but somewhat unlikely view of Boehm’s claims could be that his proposed genes for moral behaviour evolved by natural selection identically among human groups wherever they happened to be. That would be despite a maximum global human population of a few hundred thousand, at most, distributed over the 85 million square kilometres of Africa and Eurasia. Genetic studies of living humans suggest that at times of great environmental stress there were far fewer people, even a mere few thousand, distributed just as widely. Meeting other bands would have been a very rare event for most people. There is a hint in Moral Origins that humans since 45 ka have been superior to their predecessors and to those other groups with which they once shared the planet: Neanderthals in Europe (until 25 ka); in Asia Denisovans,[iv] Homo erectus (until 25 ka) and H. floresiensis (until 13 ka). This is a path that takes Boehm towards teleology – the idea that hominin evolution was a process of continual improvement that culminated in H. sapiens. But the notion of species is another human construct, being most simply defined as a group of organisms capable of interbreeding and producing fertile offspring, which obviously can only be applied with confidence to living organisms. Recent work on the DNA of living humans, and extinct Neanderthals and Denisovans, shows that genetic markers flowed from them to all living Europeans, Asians, Australasians and native Americans[v] – but not to Africans, who show no trace of contacting and interbreeding with either group. This must have happened through successful mating between modern humans and Neanderthals about 100 ka ago in the Levant and with Denisovans more recently in E Asia. The descendants reached all parts of the habitable world, except back to Africa and survive as “Homo sapiens”, which casts doubt on assigning all three to different “species”. Who is to say that Neanderthals and Denisovans were “better” or “worse” than us, or “primitive” by comparison? About 300-400 ka ago they descended from African ancestors, but then moved to Europe and Asia. They certainly appeared earlier than modern humans, but, through isolation, accumulated new segments into their DNA, inherited from the African ancestors they shared with us. Neanderthals and Denisovans adapted to the conditions of their destinations – far cooler than Africa, and affected by episodes of glacial cold at least three times – while our direct ancestors adapted to the warmer conditions in Africa itself. Neanderthals happened to end up looking distinctly different from us, and their “tool kit” was less diverse than that of the anatomically modern humans who they encountered around 40 to 45 Ka. (We know nothing about either the tools or the physiology of the Denisovans). There are indications that Neanderthals did modify their tools after the “encounter”, but for some reason they failed to survive – possibly because nomadic, anatomically modern humans depleted local resources so that more territorial Neanderthals had less to live on at a time when conditions in Europe were becoming difficult for either group to survive. It is difficult to imagine that Boehm, an anthropologist, is unaware of these issues, in the same manner as one would not expect any geologist to be unaware of the role of fossils in arranging rock strata in time order. They are omitted, along with much else that is relevant, such as the roles of female members of groups. There can be little, if any, doubt that the human traits that amount to basic morality are overwhelmingly useful in societies of conscious beings, even when they are distorted by alienation as they are today in societies divided into classes. Yet the fundamental requirements of any animal species are: sustaining life day by day through the resources of food and water; avoiding predation and other environmental threats; and reproduction. The enormous benefit as regards sustenance that was conferred on hominins by the invention of stone tool manufacture is quite clear. It spread among all known members of the genus Homo, changes in technique and design were widely shared, and it became geographically universal. Tools, together with fire and shelter, have made human life increasingly secure and adaptable over our 2 million-year history, and they spread to every continent except Antarctica from as early as 1.8 Ma. But does anyone argue for a “tool-making gene”? Many birds and mammals have been seen to use parts of their surroundings to obtain food. Wild chimps are ingenious to the extent that they can grasp the potential of some object to satisfy their ends – a stick to probe for termites or a stone to crack nuts – but they have to learn their use from the inventors, and no doubt their ancestors did too. But some chimpanzees don’t use such tools of opportunity at all. Nevertheless, such habits are convincing evidence for consciousness in some form. What is done when consciousness is directed at elements of the surrounding world is likely to control how that consciousness develops. People living in rich countries today potentially have a huge range of tools to help them become ingenious in many different ways, so they live in a highly ingenious society – because they learn to do so – and this enriches culture. Reduce the range of tools, and individuals with the same potential would be less ingenious with a simpler culture. Consider the first stone tools: a somewhat greater leap for humanity than the astronaut Neil Armstrong stepping onto the Moon’s surface, I think. What level of development would they make possible for individuals with the same brain capacity as today, but born into a society without tools? Conversely, place a young person from a society with a low level of material culture into a modern, well-endowed social context, and there is no doubt that they would cope and thrive as well as someone born into that society. Indeed there is copious evidence that they do so. Through using the huge diversity of tools, humans’ consciousness would expand as would the culture of their society. Conversely, at the first adoption of tools consciousness and culture would be far more limited. the tools with fossils of whoever made them until half a million years later. No doubt those earlier hominins’ consciousness of the natural world on which they had to depend would be highly developed as regards sustaining themselves by what it offered. That would increase rapidly as the tools allowed them to manipulate the world in novel ways. There is one feature of their heightened consciousness and ingenuity that we can grasp: such tools appear far and wide in the archaeological record from 1.8 Ma onward, from southernmost Africa to China. Their makers were able to pass on the skills of manufacture, and knowledge of how to use the tools, to successive generations – the first signs of a culture. Moreover, a culture that literally took them places! Much the same can be said of later developments, such as the two-edged hand axe (1.6 Ma) and blades that could be hafted to shafts to make projectile weapons (500 ka). And the same can be assumed for tools made of less durable materials – pointed sticks, nets, baskets and so on – that are rarely, if ever, preserved in soil or sediments. How people think, their consciousness, changes with the tools – in the widest sense – at their disposal: the two are inseparable. In the distant past long periods elapsed when tools hardly changed at all: the bi-face “hand axe” was superseded more than a million years after its first appearance. That has often been taken to suggest that their makers were pretty dim-witted by comparison with us. Their brain capacity was certainly smaller than that of modern humans. Yet in 2003 a cave on the eastern Indonesian island of Flores provided evidence that seemingly destroys the supposed link between brain size and consciousness. From 94 to 12 ka before the present, and perhaps far longer[vi], Liang Bua cave was used by hominins no more than a metre tall, whose brain capacity was as small as that of far more ancient australopithecine and of modern chimpanzees. In most other respects they resemble modern humans, but their anatomy is sufficiently different to suggest they were of a different species (H. floresiensis). They made sharp blades from the local volcanic rock, hunted giant rats and a diminutive species of elephant, survived contact with modern humans for tens of thousand years, and originally navigated the perilous deep straits separating Flores from islands to the west. 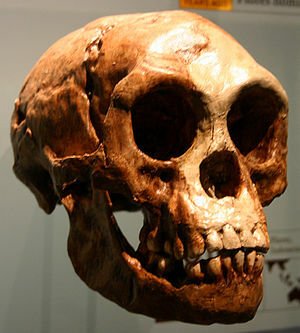 Possibly they descended from much larger H. erectus migrants, becoming small through adapting to restricted island resources – a common feature of fauna isolated on islands, including the tiny elephants that H. floresiensis hunted. There can be little doubt that they were conscious beings as well as successful survivors. That Neanderthals possessed the moral traits of empathy and altruism is amply signified by a skeleton of a male found in a cave at Shanidar in the Zagros Mountains of Iraq. The individual, estimated to have been 40-50 years old at death, had suffered a blow to his face that had crushed his left eye socket and probably left him blind. His right arm had been multiply fractured at an early age, causing loss of the lower arm and hand. Both wounds had healed long before his death. The arm injury seems to have affected his entire right side, possibly through paralysis, so that over a long period the resulting severe limp had deformed his lower legs and feet. Despite these crippling traumas earlier in his life, the man had survived to an age equivalent to 80 or more among humans alive today. Unaided, that would have been impossible. There is other evidence that Neanderthal groups cared for their sick and aged, such as an equally elderly individual from La Chapelle-aux-Saints, France, who had not only lost his teeth, but a large proportion of his jaw bone and also endured advanced arthritis. The Shanidar site is also notable for apparent signs of ritual burial, including scattering of plants with known medicinal properties and placement of stone tools with the bodies. [i] Schlebusch, C.M et al. 2013. MtDNA control region variation affirms diversity and deep sub-structure in populations from southern Africa. Evolutionary Biology, v. 13, Article 56. [ii] Henry, A.G and 8 others 2012. The diet of Australopithecus sediba. Nature, v. 487, p. 90-93. [iii] Evidence was recently presented that Homo erectus had the physique needed to throw projectiles at speeds as high as those achieved by modern human athletes (Roach, N.T. et al. 2013. Elastic energy storage in the shoulder and the evolution of high-speed throwing in Homo. Nature, v. 498, p. 483 – 486). So, at the time of their appearance, around 1.8 Ma ago, H. erectus would have been equipped for throwing rocks and wooden spears fast enough to bring down substantial prey animals. The paper shows that chimps do not have this ability, and neither did pre-human hominins – although the latter show some of the anatomical features needed for such throwing, which may have begun to evolve once an upright gait had freed the hands, arms and shoulders from supporting the body during walking. [iv] Bones dated at 41 ka in the Denisova Cave in southern Siberia had been suspected to be either modern human or Neanderthal. However, DNA analysis produced the surprise that one of them (a finger bone) was neither. Such was the difference between the DNA from it and the existing Neanderthal and human genomes that it had to be regarded as being from a different species, so far unnamed but “tagged” as Denisovan. [v] Green, R.E. and 55 others 2010. A draft sequence of the Neanderthal genome. Science, v. 328, p. 710-722. Reich, D and 27 others 2010. Genetic history of an archaic hominin group from Denisova Cave in Siberia. Nature, v. 468, p. 1053-1060. It has been reported that Maasai people in east Africa may have a small Neanderthal component in their DNA, while the Hadza and Sandawe show such links to perhaps even earlier archaic humans. [vi] Stone tools, but no hominin fossils, occur with dwarf elephant bones in sediments as old as a million years elsewhere on Flores. [vii] Zilhao, J. and 16 others 2010. Symbolic use of marine shells and mineral pigments by Iberian Neandertals. Proceedings of the National Academy of Sciences, v. 107 pp. 1023-1028. [viii] The notion of a “human cultural revolution” at around 40 to 30 ka in Europe was thoroughly debunked by a detailed study of evidence for earlier human artistic culture in 2000 (McBrearty, S. & Brooks A.S. 2000. The revolution that wasn’t: a new interpretation of the origin of modern human behaviour. Journal of Human Evolution, v. 39, p. 453-563). More recently a spectacular quartzite figurine from a site at Tan Tan in Morocco (Bednarik, R.G. 2003. A Figurine from the African Acheulian. Current Anthropology, v. 44, p. 405-413) and a similar object from Berekhat Ram in the Golan Heights, Syria (d’Errico, F. & Nowell, A. 2000. A new look at the Berekhat Ram figurine: Implications for the origins of symbolism. Cambridge Archaeological Journal, v. 10, p. 123-167) push art back before the appearance of anatomically modern humans to around 300 ka.